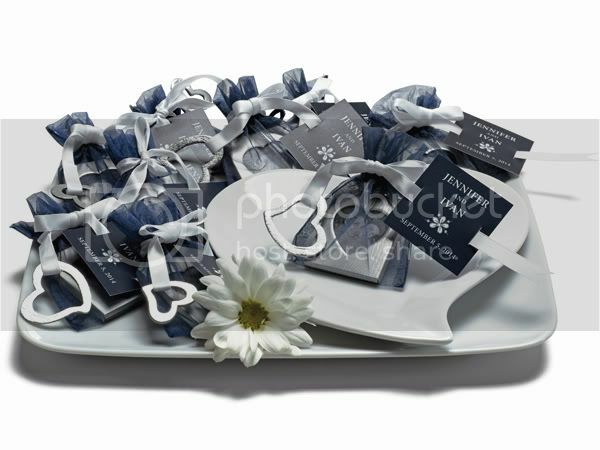 Finding wedding favors that suit your wedding style to perfection — and fit into your wedding budget — is sometimes a difficult challenge. Instead, choosing to make your own favors can help alleviate the stress of endless searching and it really gives you creative control to put your own personal spin on your favors and make them all your own. As a sort of continuation to last week’s blog post all about DIY wedding favor boxes, here is a two-parter that explores six simple yet fabulous goodie bag favor ideas. 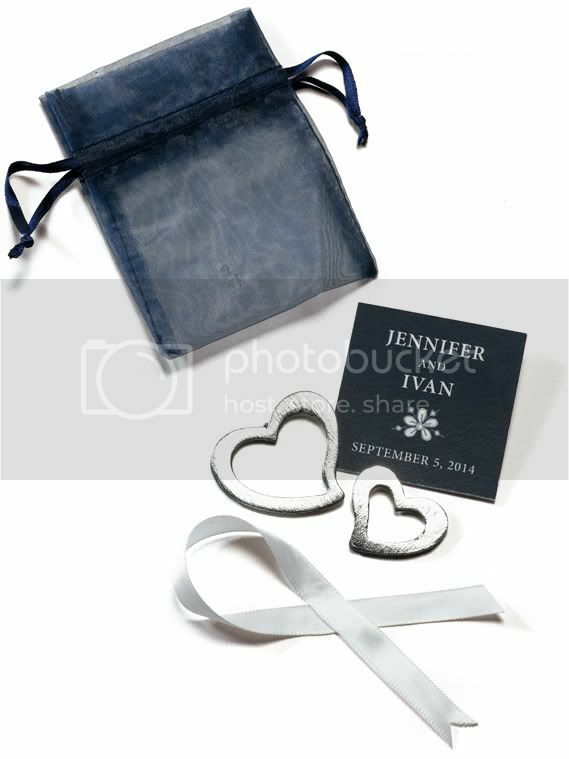 Fill these pretty little see-through bags with a heart-shaped framed photo of you and the hubby to be — perhaps, your fave engagement photo. 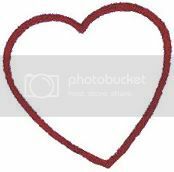 Thread one heart ornament through the ribbon and tie it in a bow around the top of the bag. Cut two small slits on either side of the tag and slip it on one end of the ribbon. Creativity tip: Not a fan of the navy? 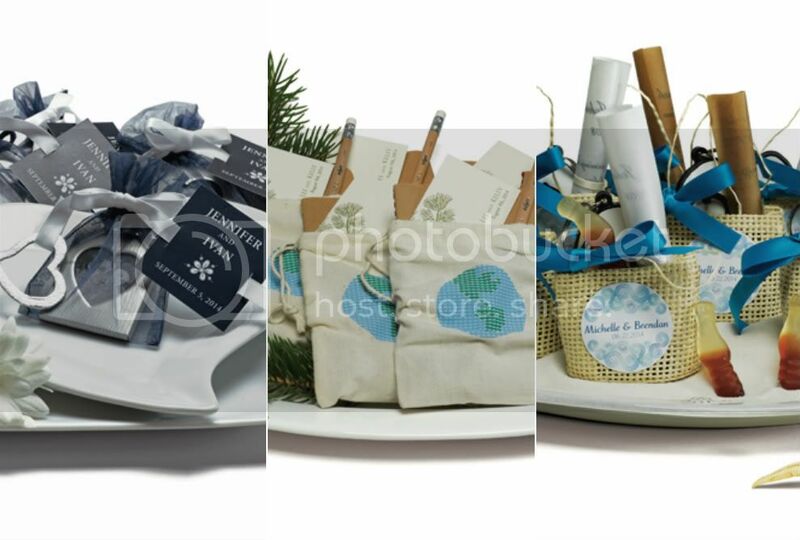 The organza bags come in 12 different colors and the little personalized tags are available in 9 colors. Mix and match various color combinations to fit your theme. 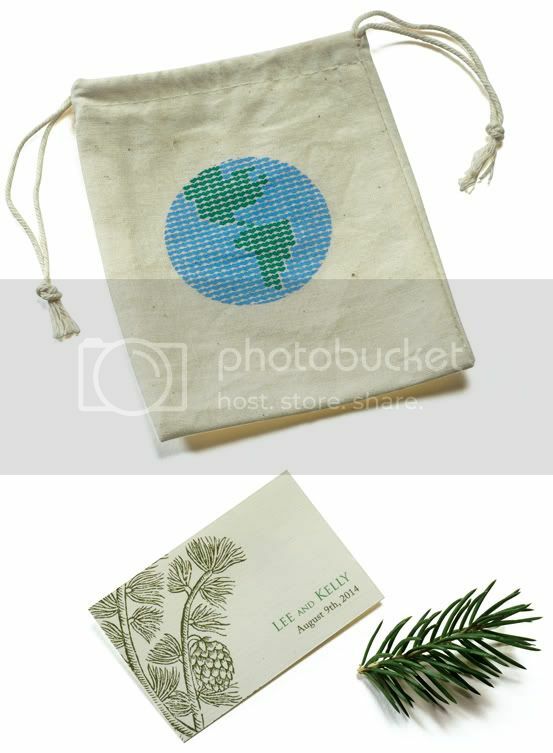 Not only are these little goodie bags too cute for words but they’re also entirely friendly to the environment. Place a small notebook and pencil — or any other trinket you wish — in the bag with a personalized card. Then display with pine branches, pine cones, leaves, rocks or any other natural accessory you happen to find in your backyard. These little beach bags are oh-so-sweet for weddings on the beach, at the marina or really any casual summer celebration outside. 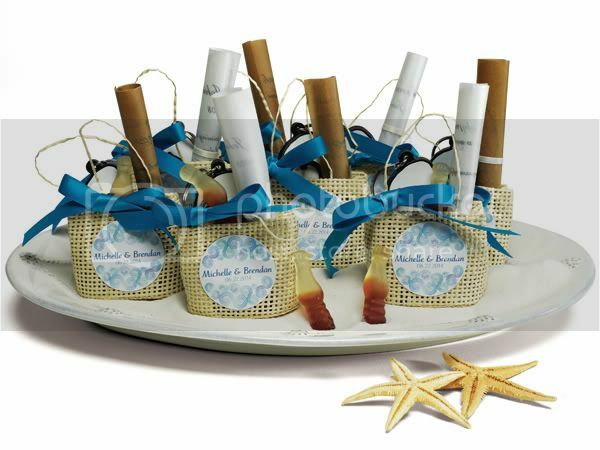 Simply write out a small thank-you note to your guests and roll it up like a pirate’s scroll. Place it in the bag with some candy or other seaside trinkets and tie a bow on one of the handles for decoration. Add a personalized sticker as the finishing touch. Creativity tip: If you would like to make a donation to a charity as your guest favors, the scrolls are a great way to hand out the note to your guests. Check back on Friday for Part 2 of this goodie bag DIY series. I’m in love! The mini woven beach bags are to die for! Plus, it’s a favor that only takes a minute, how can you beat it? 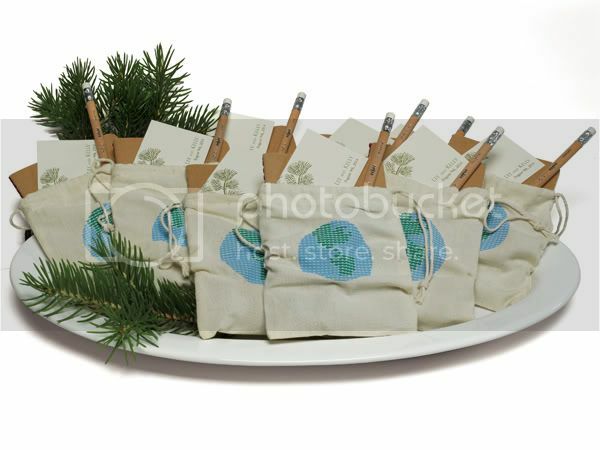 Those eco wedding favor bags are too cute! And what a fantastic idea to also put in sweet smelling herbs with the favor so that there is a gorgeous fragrance through the reception.